Overall I have really enjoyed the first part of this project and have learnt skills that I have never had to master before, such as the basics of how to create an accurate insitu drawing of a room using viewpoint lines. The two themes that my team have decided to go with are post modernism and nostalgia. At first I was really confused as to what exactly post modernism means and was confused about the difference between that and modernism. After a lot of independent research on the project I am much more confident. In terms of nostalgia, at first we were more looking at how artists represent nostalgia in their work, through a sense of longing and memory. We then moved on further to our own personal nostalgia from our childhoods. While we were initially discussing this we realised that we were all either born in or at least lived through the 1990’s, and everything that we were recalling was from this period. This included television shows, music and toys. These two themes link together really nicely in terms of colour palette and shapes and we have tried to work with this and kept in in mind while designing each component in our room proposal. Compared to the other groups’ themes and ideas, ours does have a much more humorous and playful feel, and is definitely more colourful. One thing I am worried about is it looking tacky and too overwhelming. I think there is a fine line between it looking professional and well executed and being over done. I always have found working in a team hard and after last year’s field module, aimed to be more open to other member’s ideas and ensuring better communication between people. I do think I have achieved that over the last 5 weeks to an extent, however I have still found it hard. I think having quite a few strong personalities in one group is a recipe for disaster, alongside not having half of the group present for most of it. This did make it difficult but I do think we dealt with it well, and by assigning everyone with their own responsibilities and jobs we were able to put all of our focus and energy into those aspects. My particular responsibilities are the seating (cushions) and the artwork for the frames. These were initially going to be produced by everyone but some people thought that this might be too much work, and I was happy to take responsibility, along with Hannah (Lewis). I have looked at a number of artists for inspiration and am really looking forward to developing my ideas and experimenting a bit more with them. It is all going to be very stitch based and with incorporate skills that I am already confident with, for example free machine embroidery, with things I had never really tried before, i.e. stitching onto paper/photographs. The chatter box installation on the ceiling was originally Ilona’s responsibility, however with her being an erasmus student, she won’t be returning after the Christmas break. Although this is a huge shame that she isn’t able to carry on with her ideas and concepts which she has contributed to the team, we as a group were able to overcome this quite easily by sharing out the responsibilities and deciding to made most of the structure as a team. This is something that I am actually quite proud of. The one thing which I am the most worried about when we start the more practical side of this project is the actual skills required for some of the things we want to create. This was worse when we were a group of four, made up of just textile and fine artists, but I am more confident after the arrival of two of our missing team mates, who do bring some more knowledge of construction to the team. I am really looking forward to coming back in January and to see our ideas and concepts that we have been talking about for 5 weeks come together and become reality. It is going to be intense and there is a lot of work to be done, but if we really work together at making everything cohesive, I think we have the capability of producing something we will be really proud of. The last couple of days have been super busy, with everyone running around finishing off last bits for tomorrow’s presentations. We finally went through the presentation today as a group (except Jimmy who couldn’t make it in) and am feeling much better about it all now. We also finished the scale model and portfolio. I think the model looks okay, looking around at the other groups’ models I’m feeling like theirs does look more professional and slick, but these are also groups with product design members. I’m really impressed with the ceiling which was made my Ilona and Hannah, I think it successfully portrays what we are hoping to achieve with the chatterbox installation. Today I also had to create another scheme board because just as I had finished mine, we were told that it doesn’t look very professional with a lot of handwritten annotations all over it, which I had a lot of. I do agree with this though and am much happier with my new one, which I spent a lot more time on. I also added some colour to my insitu board to keep it in with the theme of the actual room. To do this I used watercolours. They contrast with the perfectly straight, harsh, black lines of the image and I like this effect. I think this reflects my style of working better than filling the shapes in perfectly with blocks of colour. I feel like this is important to keep the type of illustration I like doing in my work in this project, because I am so out of my comfort zone with everything else. Today I went to the stitch workshop for about an hour and had a quick go at stitching out my illustration of the ‘chip stick’ packet using free machine embroidery. I’m really happy with how they have turned out and this is definitely something I’d like to develop further for my work to go into the frames on the wall. The first half of this project is coming to an end, with our final concept presentation next Thursday (10th Dec). After finding out that we needed to produce an A3 insitu drawing and scheme boards each, I was a bit worried. I love drawing but accurate, line drawings are definitely not my strong point! It is really helpful to see each of the concepts finalised and all together. I’m happy with what we have, but am still a little concerned about it being doable. I’m confident about the elements that I am responsible for, it will take a lot of work but I am looking forward to developing my ideas, particlarly for the frame art. The seating in our room is something that has changed a lot over the last few weeks. We started off wanting 2 benches, which I made for the scale model of the room. We then decided that they would need to be curved for the oval table. After thinking realistically about how many people we have in our team and the skills that we all have, we have settled on keeping the green chairs which are already in the room. After making this decision, we were thinking about making slips to cover the chairs completely, but because the chairs are in our colour scheme, there isn’t really any need to do this. Finally we’ve decided on a round cushion on each of the 8 chairs. 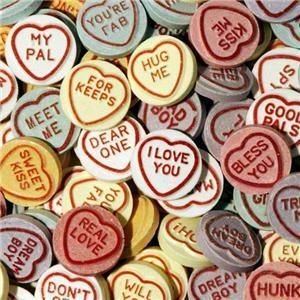 These will be the shape of love hearts but instead of the traditional sayings normally printed on these, they’ll have 90’s slang written on them. This could be screen printed, appliquéd or embroidered digitally. I think the cushions are going to be envelope backed and be filled with round cushion inserts. This could get quite pricey so I’ll have a look around at the cheapest option. I’m planning on making them from pastel coloured poly-cotton. Today we went to the ReCreate Warehouse at Ealy Bridge and picked up loads of materials to use for our rooms. We got thick cardboard tubing which will be perfect for the legs of the table, a load of plastic lids and duplo bricks, barbies, video tapes and loads more. I’m really glad we went to the warehouse because I feel like it has brought us together more as a team.